Kentucky State University officials announced today that the head coaching position in the football program is now vacant, as they parted ways with legendary coach John L. Smith, in accordance with his 2016 Kentucky State University Board of Regents approved contract. Kentucky State officials said they seek to take the program to new heights. “Kevin Weston, defensive coordinator, will serve as interim head coach as we close out the semester and finish junior college recruiting,” Thomas said. Smith advanced the football program early in his Kentucky State tenure, earning the 2016 Southern Intercollegiate Athletic Conference (SIAC) West Division crown and finishing runner-up in the SIAC championship game. The Thorobreds lost a nail-biting overtime thriller to Fort Valley State to end the season. Smith earned the 2016 SIAC Coach of the Year for that campaign. 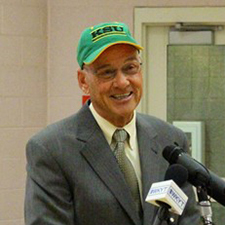 Smith came to Kentucky State with over 40 years of college coaching experience, more than 20 of those as a head coach. Prior to his 7-25 record at Kentucky State, he posted a 150-113 record at six schools as a head coach. Notable stops on that list include the University of Louisville, Michigan State University and the University of Arkansas. Smith was named the Big Ten Coach of the Year in 2003. Smith went 41-21 at Louisville from 1998-2002, a stretch that included five winning seasons, five straight bowl appearances and two conference championships. Smith also had head coaching stops at Utah State University and the University of Idaho. He served in various assistant coaching roles at Idaho, Weber State, Montana, the University of Nevada, the University of Wyoming, Washington State University and the St. Louis Rams.